A humidity detector, also referred to as a humidity meter or humidity gauge, is a device with a humidity sensor that measures the relative humidity in the air. PCE Instruments offers a number of humidity detector products including handheld humidity detector, data recording or data logging humidity detector, and combination or multifunction humidity detector devices that also measure parameters such as room or ambient temperature and atmospheric or barometric pressure. A humidity detector can measure relative humidity (RH) as a percentage (%) from 0 to 100 % RH, depending on the humidity measurement range of the specific model. Humidity is a key factor in everything from library and museum archival to agriculture, construction, manufacturing, transportation, warehousing, and heating, ventilation, air conditioning and refrigeration (HVACR). 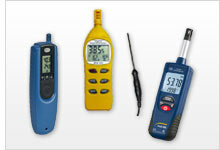 A relative humidity meter also is helpful in evaluating workers' heat stress risk on production floors and job sites. In addition, humidity plays an important role in the residential sector. If the humidity is too high in a private household, mold can grow. Mold creates a health hazard for anyone breathing the air in the home. The humidity detector PCE-VDL 16I from PCE Instruments measures and stores the relevant measured variables: temperature, relative humidity, air pressure, light as well as acceleration in three axes by means of a vibration sensor. Therefore, this humidity detector is ideal for monitoring vibrations on machines while simultaneously measuring and recording the relevant environmental conditions of the system. PCE-HVAC 3 is a multifunction humidity detector, tester or diagnostic measuring device used for indoor climate and environmental monitoring. In addition to measuring relative humidity and ambient room / dry-bulb temperature, the meter calculates dew-point and wet-bulb temperatures in degrees Celsius (°C) and Fahrenheit (°F). Thus, heating, ventilation and air conditioning (HVAC) installations and HVAC system performance assessments are key applications of the PCE-HVAC 3 meter. The PCE-FWS 20 Humidity Detector Station is a multi-functional wireless digital device that will exceed your expectations. This manufacturer-calibrated meteorological instrument accurately measures temperature, relative humidity, precipitation, atmospheric pressure, wind speed and wind direction. Featuring a free-standing or wall-mountable touchscreen LED display with backlight, the PCE-FWS 20 makes a fantastic gift. The Humidity Detector combines various functions and sensors in only one instrument: Air Humidity Meter, Wind direction, Wind speed, Temperature meter, rainfall, and data logger. Furthermore, the meteorological station has different alarm functions and settings for the measurement parameters. The measured data can be sent by radio to the base unit (max. distance of 100 m). This test instrument is equipped with the latest technology used in meteorological analysis. The touch screen allows you to recall data onto the screen easily. The PCE-FWS 20 Humidity Detector is for private and professional use. This meteorological station allows the accurate detection of wind direction, wind speed, temperature, relative humidity and precipitation. The USB port and the included cable allows transmission of data from the device to a computer. Software for analysing data is also included, which enables you to analyse and check meteorological fluctuations, presenting data in graphs and diagrams for measurements over prolonged periods of time. The Multifunction Humidity Detector PCE-THA 10 is easy to operate with one hand thanks to its compact size, the new structure and integrated impeller. In addition to the humidity, the humidity detector measures the temperature, wind speed, dew point, the wet bulb temperature and the air volume. Average wind speed values can be determined with the humidity detector from the 20 preset points. The humidity detector PCE-HT 50 is suitable for continuous monitoring of the room climate. This is how the humidity detector finds its application in homes or at work. The humidity detector has an internal sensor for air temperature and humidity. PCE-444 is a combination digital hygrometer and digital thermometer used to measure air temperature, relative humidity, dew point temperature and wet bulb temperature. This portable handheld pocket-sized mini thermo-hygrometer allows for the quick and easy determination of indoor ambient environmental conditions. The Humidity Detector PCE-TH 5 is a universal temperature / humidity gauge which allows the measurement of both the ambient temperature and the ambient humidity, as well as the determination of the dew point and wet bulb temperature. - Humidity measuring range: 0 ... 99.9% r.H. The PCE-ITF 5 humidity detector is used to measure the humidity, temperature and surface temperature simultaneously. This humidity detector PCE-ITF 5 is ideal for detecting heat bridges and incorrect ventilation behavior in homes, houses, etc. The PCE-HT 71N Humidity Detector detects air temperature and humidity and stores readings in its internal memory. The Humidity Detector has a compact format and a wide memory capacity (up to 32,000 values / 16,000 values for each parameter) and it is mainly used as a Humidity Detector in fields such as supermarket refrigeration units, refrigerated transport, warehouses, and other temperature controlled environments. The PCE-BTH 10 is a compact and easy-to-use Bluetooth humidity detector. This Bluetooth humidity detector is characterized by its simple one-button operation and integrated interface. The Bluetooth humidity detector PCE-BTH 10 measures the air temperature and humidity. PCE-555 is a combination digital hygrometer and digital thermometer used to measure relative humidity as well as air temperature, dew-point temperature and wet-bulb temperature. This handheld multifunctional meter allows for quick and easy analysis of environmental conditions indoors and outdoors. PCE-EM 886 is a portable handheld multifunctional digital device used to measure sound, light, humidity, temperature, AC / DC current, electrical resistance, capacitance and frequency. The Multifunction Humidity Detector PCE-THA 10 is easy to operate with one hand thanks to its compact size, the new structure and integrated impeller. In addition to the wind speed, the Humidity Detector measures the temperature, humidity, dew point, the wet bulb temperature and the air volume. Average values can be determined with the Humidity Detector from the 20 preset points. PCE-EM 882 is a portable, handheld, multifunctional digital device capable of measuring four different physical parameters. An ideal tool for use in industrial hygiene, HVAC performance assessment and environmental condition monitoring applications, this easy-to-use measuring instrument includes sensors for measuring sound, light, temperature and relative humidity. The PCE-THB 38 Humidity Detector is ideal for detecting and digitally displaying humidity, temperature and barometric pressure. Temperature is measured by an RTD sensor and air humidity is measured by a highly repeatable, capacitive sensor. All products are test instruments, and the Humidity Detector is sent out manufacturer calibrated. An ISO certification is available optionally. - Relative air humidity: 10 ... 95% r.h.
- Barometric pressure: 10 ... 1100 hPa (mbar) / 0.14 psi ... 16 psi. The PCE-HT110 Humidity Detector precisely measures air temperature and relative humidity. This accurate and reliable device shows the current measurements on the large LCD display and saves the measurement data directly to an SD card (included). The PCE-HT110 is equipped with two channels, accommodates an SD card memory of up to 16 GB, offers an adjustable measurement rate / sampling interval, and includes a wall mount, making the device ideal for logging data over an extended period of time. The PCE-HT 71N humidity detector detects air temperature and humidity and stores readings in its internal memory. The humidity detector has a compact format and a wide memory capacity (up to 32,000 values / 16,000 values for each parameter) and it is mainly used as a data logger in fields such as supermarket refrigeration units, refrigerated transport, warehouses, and other temperature controlled environments.